There are several sites you just have to see when you travel to Ireland - from the windswept Cliffs of Moher to the rugged terrain of the Aran Islands. If ancient history is your thing, Ireland has plenty of it: try Newgrange or the Hill of Tara in County Meath. For sheer unadulterated, natural, beauty try the Giant's Causeway or the entire Ring of Kerry or even the county of Cork. But there is more to Ireland than countryside, with many attractions in Dublin city, such as Trinity College and the Guinness Storehouse. Visit the historic city of Cork or discover the wealth of culture and heritage in Galway city. When you make your pilgrimageto the Cliffs of Moher, you’re coming for one of two things: the staggering height of the rock face, and the even more staggering beauty of the views from the top. Soaring to 214m, the striated stonereaches its long fingers southward to counties Cork and Kerry beyond, with a keen eye even able to spot the Aran Islands to the north. Visit the Aran Islands, meet a local Aran Island guide, see the impressive Bronze Age fortress of Dún Aonghasa overlooking a sheer 300-foot drop to the Atlantic. Meet the Islanders and hear the folklore, language and song of the Island. With its amazing views of the Atlantic Ocean, National Geographic magazine has named the Dingle Peninsula as one of the most stunning places in Ireland. Stop along the way and see Fahan the largest collection of stone dwellings in Ireland. These buildings, known as ‘beehive huts’ because of their shape were built and inhabited in early Christian times by a people about which we know very little but this only adds to the air of mystery, which surrounds this settlement. 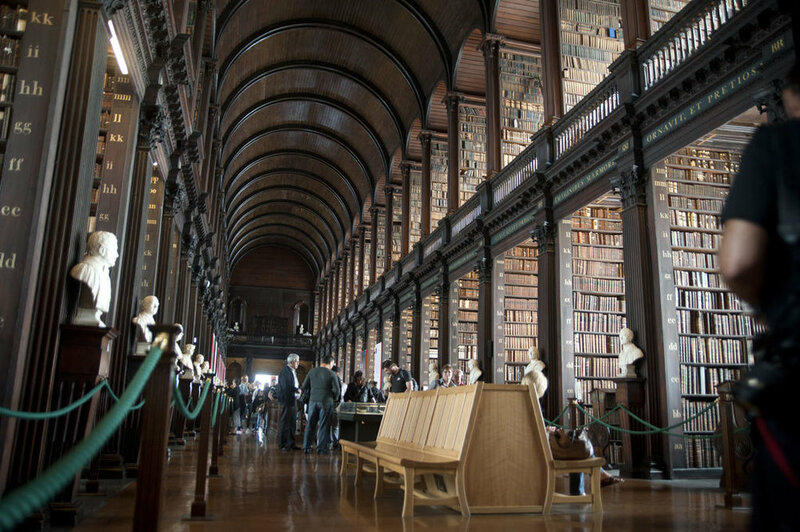 Trinity College is home to the Book of Kells, Written around the year 800 AD, the Book of Kells contains a richly decorated copy of the four gospels in a Latin text. Originally a single volume, it was rebound in four volumes in 1953 for conservation reasons. The main chamber of the Old Library is the Long Room, and at nearly 65 metres in length, it is filled with 200,000 of the Library’s oldest books. Contact Celtic Footstep Today !